Wisconsin workers knew Right to Work legislation was on its way, we just didn’t know when. Sweeping the country state-by-state, creeping out of the south and into union strongholds Michigan and Ohio in recent years, this anti-worker bill loomed over the Badger state as soon as a Republican majority was sworn in this year. Several things to consider when hearing rhetoric on Right to Work: (1) unions are democratic institutions that the members can vote out; (2) union security clauses, which guarantee everybody pays dues are democratically bargained into most contracts; (3) union members are already able to opt out of paying dues that don’t relate to the collective bargaining agreement; and (4) unions are going to have to provide all the services to people who choose not to pay. Members of Bring Back the Fight, many of whom are veteran fighters of corporate greed on the shop floor, wanted to see an all out fight by labor unions against Right to Work. We knew it was an uphill battle. This wasn’t just an attack by the Koch brothers or a fringe right wing like some said. The wealthy and powerful, down to the Chamber of Commerce, almost unanimously agree this is the future for us workers. Yet we didn’t want to go down without a fight. The only thing hundreds of years of labor union history tells us is that we have to fight to survive. We supported all efforts of labor in this fight, which was pretty easy to do, since labor leaders and the Democrats didn’t want to touch the issue until it was suddenly brought forward in an extraordinary special session, a tactic to ram this through before constituents could see what this bill was all about. Members of Bring Back the Fight threw together an ad-hoc coalition of forces to make sure the Capitol rallies this time around weren’t just a funeral procession but rather a protest, like we saw in 2011 against Act 10. We organized a protest in Milwaukee the day before rallies began in Madison to gather up some steam. In negative-degree weather we brought out hundreds and over a dozen prominent unions such as our own, Teamsters 344, along with the teachers union, a United Auto Workers local, and many more. After a short rap of speeches that made it into every major news outlet in the city, we took it to the streets and temporarily shut down Milwaukee’s busiest street, Wisconsin Ave. The next day we mobilized to Madison, where the real fight had to be held. We organized another march that brought out hundreds again and fed into the main AFL-CIO rally. Then after the rally, we whipped up the support of thousands and took the streets surrounding the Capitol. Inside the Capitol, we led chants, speeches, and combined our work with other unions to delay and shut down Senate and Assembly meetings. Much more would have been needed to be done to defeat right to work. In 2011, when Gov. Scott Walker went after public sector union collective bargaining agreements, Teachers performed a creative strike of sorts by calling in sick. This and the walkouts by students rallied hundreds of thousands to the Capitol and even led to an occupation of the Capitol for weeks. The protest movement in 2011 showed just a glimpse of the possibility we have in this state to turn things around. And these recent protests showed what just a few unpaid Teamsters can do. Imagine if all the labor unions met months before and drew up a war plan. 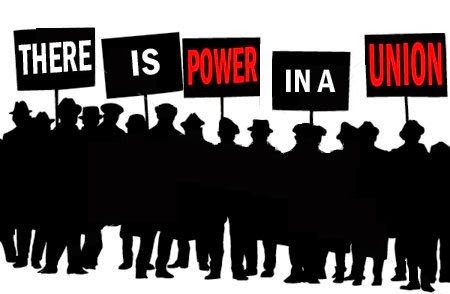 We’re not saying we were powerful enough then or now to truly defeat these attacks (unions only have roughly 7% of private sector workers in the state), but if we solely rely on Democrats to fight for us, we know we’ll definitely lose and invite further attacks rather than inspire the working class of Wisconsin to rise up. We don’t have all the answers, but here are a few things we know. First, Right to Work isn’t a death-sentence; it will only weaken us. We need to make up for this by redoubling efforts to attend union meetings and get involved. Business agents are only as good as their stewards who are only as good as the rank and file. Campaigns against workplace harassment, supervisors working, and other issues can educate and train a new layer of union activists. Second, we need another victory like 1997 for UPS Teamsters. A yearlong contract campaign led to a two-week strike that saved our pensions and created 20,000 full-time jobs, among other improvements. This event inspired workers across the country and showed what unions can do to improve working people’s lives. Third, the concept of Right to Work has been around a long time. The reason it comes to our state now is a result of 30 years of decline in the labor movement. It’s probably time to rethink our strategy of relying on the Democratic Party and electoral politics. Labor unions historically transformed the wage scales of entire industries with the use of production-halting strikes and workplace-based solidarity. These efforts brought millions into collective bargaining agreements like never been seen before. Maybe electoral politics should be viewed as just one tool in the toolbox but not the fundamental solution. We know it’s all easier said then done, but we know workers will never give up fighting against corporate greed, however a devastating blow we just suffered. We’ve suffered worse. People like those in Bring Back the Fight know our future is bright and are ready to lead the fight. > The article above was written by labor activist Daniel Ginsberg and is reprinted from the Bring Back the Fight website.